What's wrong with this picture: Shaq's in Miami. Kobe is now running the LA Lakers. And the Dodgers are in first place? All of us here in LA are going to miss that soap opera, aka: "The Lake Show". If there are two BIGGER "Drama Kings" in the NBA than Kobe and Shaq, I wish someone would point them out to me ... and maybe Mitch Kupchak can work a sign and trade! As much as Rudy T. is respected around the league, I was hoping that former Utah head coach Rick Majerus would get the Laker job ... heck with Coach K! Rick would not only provide a laugher quote a minute for the local press ... he'd keep all of the restaurants near Staples in business! Since the Lakers look to be maybe the 5th or 6th best in the NBA West ... it's going to be a long season and a fun coach would sure take the sting out of that. For all of you shooters heading to Athens for the Summer Olympic Games, we have both the Lexar 80x and the HOT SanDisk Extreme compact flash cards ready for delivery. Just give Samy's industrial sales dept. a ring and say you saw it in Sports Shooter and we'll give you a screamin' price --- including an additional 10 % off of all of Lexar's 80x pro compact flash cards! We are still running a special on the Quantum Turbo 2x2 batteries for $399.00 You can power your flash and the camera on the same battery. The Nikon D2H and Canon's Mark II continue to be very hot items. We want to help out all of you great Sports Shooter readers who want one of these fabulous professional digital cameras ... give us a call for availability and pricing info. 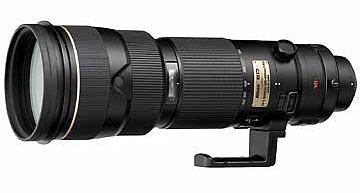 Word out of the Olympic Track & Field Trials in Sacramento was THE lens for the new Nikkor 200mm - 400 f.4 AF-S VR Zoom. Unbelievable range (especially on digital! ), lightweight and SHARP, this is the perfect all-in-one lens for that shooter on the go. Give us a call to get specific pricing and availability. While watching the sprints over the weekend, I caught a glimpse of the finish line and marveled at all of the remote cameras there (just how many of those were Bill Frakes'?). Samy's has one of the largest supplies of equipment for remote cameras ... whether it's ballheads, floor plates, LPA Designs' fantastic Pocket Wizard and MultiMax, Bogen "Magic Arms" or "Super Clamps" ... we have it waiting to be shipped to you today. When the Big Kahuna drops buy to visit our main store in LA, he heads straight to the camera bag and equipment case section on the 3rd floor. Samy's carries just about every line of bags and cases available from Lightware (we have the Jack Gruber - famous Digital Backpack IN STOCK! ), to the ever-popular Domke brand, to dozens and dozens of Lowepro bags. And looking for protection for that expensive gear? We have compact flash card wallets from Tamrac and Tenba, as well as a wide selection of camera and lens "wraps". SAMY'S SPORTS SHOOTER SPEICAL OF THE MONTH: Take 35 % off of any Tamrac products during the month of August! Also remember that Samy's is a fully authorized Apple Dealer and we also carry the full line of LaCie external hard drives and monitors. Give us a call for *very* competitive pricing. If you're in LA please drop by one of our 5 stores downtown LA, Pasadena, Santa Barbara, Venice and the new one in Orange County check out our inventory and say hello!